Fiorello H. La Guardia is best known as the 99th mayor of New York City. He was also a WWI fighter pilot, grew up in the Arizona frontier, and is a minority figure being half-Jewish and half-Italian. He was elected in to Congress in 1916 and 1918 and again from 1922-1930. His name, perhaps the bane of his existence other than his commissioners, means Little Flower in Italian. He’s only five-foot-two and has a bust of Napoleon on his desk. He is energetic, passionate, loves publicity stunts, and is known as one of the greatest mayors in American history. He is the boss and close family friend of the Art Deco Mystery Series protagonist, Lane Sanders. Q: How did you first meet your writer? A: I met Laurie through a biography she read on me, aptly named The Napoleon of New York. It was right after she moved to New York City only two weeks after 9/11. I think my passion for the city and for our difficult era really moved her. And I think my capacity tremendous humor also moved her. I often hear her telling people that I’ve given her a lot of material to work with. Whatever that means. Q: Want to dish about him/her? No, I’m too busy. I’ve got work to do! Q: Okay. Moving on . . . Tell us about your favorite scene in the book. A: I like all the action scenes! My absolute favorite was the ending of The Silver Gun. I actually got to get the bad guy. I brought my trumpet, too. Lane loved that. In The Gold Pawn, I like the end where I jump on top of Lane to cover her from the blast. And I also enjoyed –even though it wasn’t me that saved the day—when Team Fio came to rescue me. I have to say, my friends have a lot of imagination and panache, don’t you think? Q: Absolutely. Did you have a hard time convincing your author to write any particular scenes for you? A: Yes. She refuses to have me shoot more. I would have liked to shoot the bad guys in The Gold Pawn, but Chandlar told me she had a “more complicated scenario” planned. Blah blah blah. Q: What do you like to do when you are not being actively read somewhere? A: I really do like to cook and I love music. Chandlar got that spot on. I play music all the time, and I’m an excellent Italian chef. But my job as mayor is more than full time. So I truly race around the city and am a first responder at most crime scenes, fires, and traffic accidents. The fire department even gave me an honorary fire coat! Q: Cool. If you could rewrite anything in your book, what would it be? A: In final scene, the epilogue, I would be the one to witness who is really the pawn. I’m still irked Chandlar put someone else there. A: I really like them. Hard workers. Evelyn, Lane, and Kirkland are like my second family. I’m not too fond of Louie Venetti, of course. I loathe all gangsters. He’s hiding something, too. Lane keeps getting too close. I’m going to have to watch her. A: I was a fighter pilot in the war, my author doesn’t know that I’d like to fly again. I’ve been learning how to fly bigger planes on some of my weekends. Don’t tell Chandlar. She’ll tell my wife and then I’m in big trouble. A: I’m like a cyclone. People can hardly keep up with me. I’m pretty brash, too. Usually I’m just tough on people I like, to see how they handle it. I’m tough on the outside, but when people get to know me, they understand I really work hard for my people. And Chandlar is right, I’m very loud and screechy. I do flap my arms about. I think people realize after a while, that I’m a softy on the inside. I deeply care about my citizens. A: The worst thing was losing my baby daughter and first wife just a year after each other. I learned, like I did many other times, life does go on even in the darkest moments. And you keep going. You grow stronger. You find happiness in new ways. I think that’s why I enjoy this series so much. Its heart is about beauty in the midst of adversity. Our era’s creativity is often overlooked because of the Depression. But in spite of it, our humor, innovation, and gritty art is just breathtaking. A: “Muh-rie!” is my wife and best friend, she used to be my secretary. But I also have Ted Hambro, whom you meet in The Gold Pawn. We joke around a lot. No one makes me laugh like him. He’s a bank manager, and we just “get” each other. A: I love all her art and action! Sometimes in this genre, there’s just one culmination scene where all the action is. Chandlar has at least TWO culmination scenes—always, she’s promised me—and on top of that, some good chase scenes. Especially with Lane and Roarke. But I also like Chandlar’s art. She loves art like I do. Knows it’s important. I love her hidden art, things people don’t know much about, and I enjoy Lane’s love of the city. It’s almost another character in the book. Q: Will you encourage your author to write a sequel? A: Pfft! Of course! She has book 3 done, it will release in 2019, The Pearl Dagger. Someone we know is killed off, and I’m a bit peeved by that. But Chandlar promised that Ripley will live to be like a hundred. She’s of the ilk that I am, people can get killed off, but not the dog. The art behind that one…oh my. It’s one of the greatest pieces of art that transformed our culture perhaps more than anything else. Yet your time period has all but forgotten it. Chandlar is going to change that. You’ll LOVE IT. Okay, I have to get going now. Thanks so much for having me, I love this blog. Have a great day. I’ve got work to do! 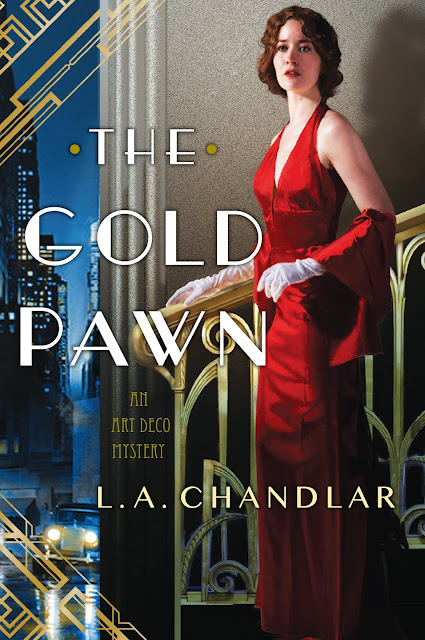 L.A. Chandlar is the National Best-selling author of the Art Deco Mystery Series with Kensington Publishing. Her debut novel, The Silver Gun released August 29, 2017, the sequel, The Gold Pawn, releases September 25, 2018. 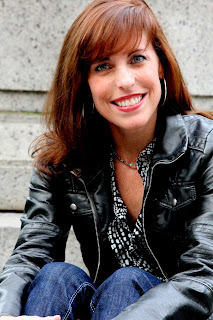 Laurie speaks for a variety of audiences including a women’s group with the United Nations. Laurie has also worked in PR for General Motors, writes and fund-raises for a global nonprofit, is the mother of two boys, and has toured the nation managing a rock band. Kensington and the author has a limited edition gold author card, swag, and a Silver Gun bracelet as a thank you gift to anyone who pre-orders The Gold Pawn and registers here!